I found this particular frame at IKEA. It comes in white or black. The frame is built such that the artwork sits securely in the back of the frame and has a clear plastic protector (rather than glass) at the top to keep out dust. There is space for a good ½” of dimensional artwork inside the frame. This is just one frame though, you can use any frame you like, and you do not have to have plastic or glass on the front. I have made several of these with the front open, and they work fine too! The theme of this piece of artwork is “Spring”. I found lot’s of possibilities for the spring theme from the 2017-2018 Annual Catalog and the 2018 Occasions Catalog. The overall size of the lemon lime twist outer mat is 8” x 10”. The whisper white mat is 6 ¼” x 8 ¼” and the Bermuda Bay mat is 6 ½” x 8 ½”. Each small square of artwork has outside dimensions of 1 ¾” x 1 ¾”. These squares alternate between lemon lime twist and Bermuda Bay. 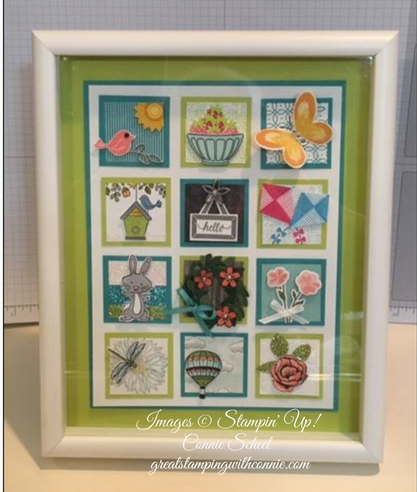 Inside each of the squares is a 1 ½” x 1 ½” square of cardstock or designer series paper. I love to add lots of embellishments – this one uses ribbon, wink of Stella, pearls & rhinestones, glimmer paper, a box wood wreath and petal passion embellishments. One of the reasons I love making these is that each square is it's own little project. You can put together many different little projects, and it creates one larger beautiful picture. Once you have a frame, you can swap out the picture each season or holiday and instantly have new decor! Why not pick out a frame and give it a try?